I purchased a cookbook, but it never asked for a login. Now when I try to go to “register”, I get a message saying this content is for registered members only. Hi Jill, when you click on “register”, are you logged in? That’s the only way for it to work. You can also click on the ‘cookbooks’ tab and click the cookbook link to access your cookbook. Let us know if this doesn’t help. Login using the username and password you created. The login box will be to the right of the screen above the ‘register’ and ‘lost your password?’ tabs. Thanks Megan for your help….going to make some cookies now! Hi Mima, with ice cream makers you have to be sure that the bowl is completely frozen solid, and that the ice cream mixture is very, very chilled, in order for it to freeze properly. Is there a stabilizer you can suggest and an amount ? Hi Mima, another factor could be the ice cream base and if the egg custard was cooked long enough to coagulate the eggs. You’ll want it to be thick like a custard sauce, not drippy and thin. As far a stabilizer goes, Cremodan 30 is a good brand. Use 5 grams per 1,000 grams of base. Thanks, Megan, I will give it a try …..
Hi Alexis, the dog treats recipe is a blog post, so you can access it right here: homemade dog treats. Happy baking! I just signed up to be a member of your website but I’m unable to “log in” in your membership login area. When I signed up I was not given an option to choose a user name and password. They just sent a link that I clicked on… I’d like to purchase both of your books. 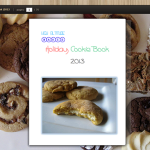 Is the 2013 cookbook available to download or can it only be viewed on your site? Hi Lorri, its like the equivalent to an electronic magazine or catalog- you can view on the site. We used to have a version available for download as well but it wasn’t performing correctly. For quick access you could also print the pages. Hope this helps and happy baking! I have made many of the cookies from the 2013 Holiday Cookie Book. Can any of these batters be made ahead and frozen to bake later? Thanks!